Can Tosh's new progeny be the touchscreen laptop we've waited for? Tablet devices such as the Apple iPad are all very well, but most of us still want our laptops to have that rather quaint input device – a keyboard. So can Tosh's new standard notebook with a touchscreen spearhead a new generation of Windows 7 touch-based lappies? Firstly, it's important to say that the spit and polish of the U500-1EX is undoubtedly classy. It's a bit thicker than we'd expected (about 3cm thick, weight is 2.2kg) but it isn't designed to be a thin and light – there's some serious poke here, as well as HDMI-out and an HD-spec webcam. Usually powered by the new Intel Core i3-330 (although the demo model we saw had a Core 2 Duo sticker and different models will be available), there's also 4GB of DDR3 and a 320GB hard drive. Hardly netbook-end specs; speed certainly isn't an issue. After all, this laptop is aimed at those who want a standard-spec notebook yet think they could make use of touch – perhaps to flick through a presentation for work or/and as a family laptop for use with photos. But unfortunately, the U500 is slightly lacking in its keynote department. Yep, you've guessed it - the touchscreen. 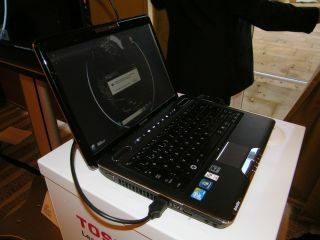 Putting the Windows 7 touch experience aside – navigating the OS is fiddly on a small touchscreen such as this – the problem is Toshiba's actual 13.3-inch TruBrite screen itself. The screen's response isn't a problem. It's no iPhone, but there's no frustration. However, the visible screen quality isn't at all brilliant and actually looks extremely grainy. We didn't notice it on Virtual Earth, but we sure did when we went back to Toshiba's branded-desktop which is mostly white. And it was just as noticeable when flicking through some photos. We were assured by the Tosh representative that this was a production model, too. So work to do there. The keyboard too, is annoying. Toshiba has decided to roll out its shiny-finish keyboard idea yet further. We just don't like it and while the U500's is better than, say, the Qosmio X500 (not least because the U500 seems much better built), it's just not grippy enough to be a good typing companion. A recommended price of £649 certainly isn't out of reach for those interested in a touch-based laptop, though you're obviously paying a premium for that screen. Tablet purists will be disappointed at the lack of hinge – this isn't a convertible – but sticking with the tradional laptop form-factor is clearly intentional. It will be interesting to see how the U500 does but for us, it's very much a square one release.